Thank you so much to everyone that attended the inaugural Venomous Herpetology Symposium! 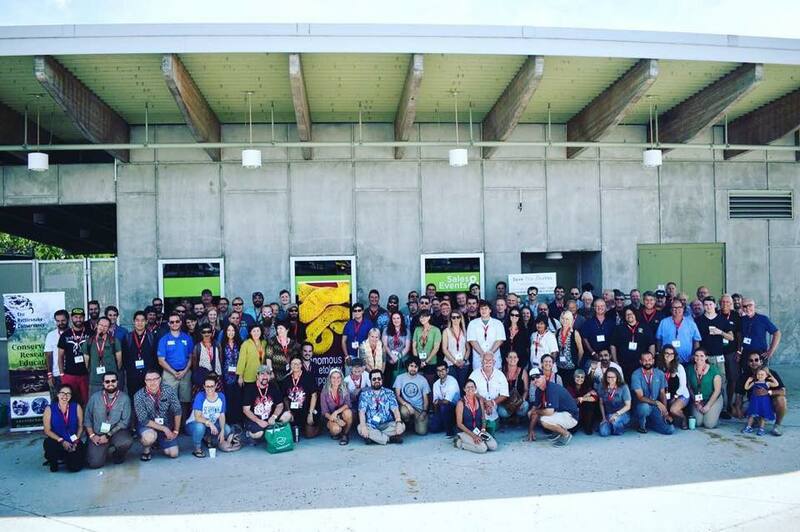 Organized by The Rattlesnake Conservancy and Save The Snakes, the Venomous Herpetology Symposium was held at Zoo Miami, Florida, on September 8-9, 2018. This year’s theme for the symposium was “Bridging the Gap”. Topics we are currently seeking include projects involving partnerships, education initiatives, biosecurity, snake bite management, managing collections of venomous reptiles, venom toxinology, conservation techniques, field research, and other relevant topics related to venomous herpetology. The Venomous Herpetology Symposium had 169 people in attendance, with speakers from seven different countries and attendees from thirteen countries and many states across the USA. Our organizations are thrilled to have co-hosted this event and are very proud of all of our volunteers, staff, speakers, and sponsors that made this spectacular event possible! Congratulations and thank you to Rom Whitaker for coming all the way from India to be our keynote speaker for this year. Rom received an award that we began called the Global Achievement in Venomous Herpetology. Rom has committed his life to the conservation of venomous reptiles in India and has helped reduce human-snake conflict and increased our knowledge about king cobra ecology. His talk was inspirational and we were thrilled to have him. For her master’s thesis, Fatima Ali used stories and visual media to bring awareness towards the protection of Massasauga rattlesnakes in Canada. Joseph Colbert explains how partnering with and engaging community members has protected eastern Diamondback rattlesnakes on Jekyll Island, Georgia. Save The Snakes Advisory Committee Member Rogier van Rossem explains how his organization, the Herpetofauna Foundation, supports venomous reptile conservation efforts around the world. Save The Snakes Board Member Dr. David Wojnowski speaks on social perceptions about snakes and snake conservation in Kenya. Royjan Taylor, from Bio-Ken, discusses his organization’s work to conserve Kenya’s reptile species. Save The Snakes Co-Founder & Program Director at Eastern Ghats Wildlife Society, Murthy Kantimahanti discusses how community-based conservation can protect king cobras and other snake species in South India. Save The Snakes Executive Director & Co-Founder Michael Starkey explains how STS will make a concerted effort to support and promote women in the field of herpetological research and snake conservation. Special thanks to two of Save The Snakes’ graphic designers who volunteered their time to contribute to this event: The Venomous Herpetology Symposium shirt logo was designed by Pablo Deschepper. Rattlesnake and king cobra illustrations used in the Symposium printed materials was designed by Anna Riddiford. Lastly, we could not have oranized this event without dedicated sponsors and a terrific venue: Thank you to our generous sponsors for supporting the event! Thank you to Zoo Miami for hosting it at their incredible facility! For more follow event updates, stories, and cool venomous herpetological facts by searching #VenomSymposium on Facebook, Twitter and Instagram! Next year the 2019 Venomous Herpetology Symposium will be hosted in Texas. We hope to see you there! Next Post International Snakebite Awareness Day!